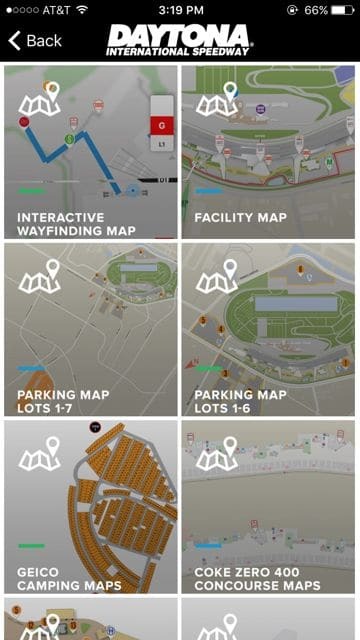 NEW YORK, Oct. 27, 2016 /PRNewswire/ — SPREO is proud to work with International Speedway Corporation (“ISC”) and itsmotorsports entertainment facilities, which include Daytona International Speedway, in offering mapping, wayfinding and location-based services that enhance the guest’s mobile event experience. SPREO’s cutting-edge Location Platform enhances ISC’s mobile app platform empowering race fans and visitors with step-by-step navigation and the ability to get closer to the on-track action. ISC is one of the first companies to go live on the new release of SPREO’s Location Platform, a next-generation interactive mapping and wayfinding software that is seamlessly integrated with Google Maps. SPREO delivers indoor mapping, interactive location and navigation, and location based applications to enterprise clients across retail management, sports and entertainment, healthcare and more. SPREO boasts industry-leading positioning algorithms, cloud platform management, and mobile app software development kits. SPREO strives to bridge the gap between the digital and the physical worlds — and connect people to their surroundings in innovative, engaging and useful ways. SPREO technology works in any large, complex building or campus, and has established credibility and expertise with landmark, award-winning achievements. To learn more, visit us at www.spreo.com.